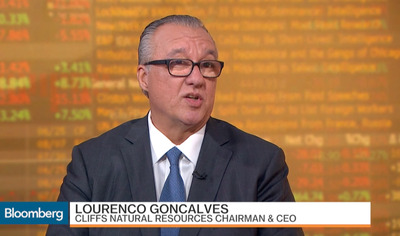 Cleveland-CliffsCEO Lourenco Goncalves took time out of his company’s third-quarter earnings call to attack a Goldman Sachs analyst and short sellers. It’s not the first time Goncalves had a contentious moment with an analyst on an earnings call. The CEO of the American iron-ore mining company Cleveland-Cliffs took time out from his company’s third-quarter earnings call on Friday morning to attack an analyst from Goldman Sachs and short sellers. He was referring to the Goldman Sachs analyst who covers his company and had an $US11 price target – just below both the Wall Street estimate and where shares were trading at the time. “Lucas, it will all be done to inflict maximum pain to these guys. I wake up in the morning every day, looking at these guys and I’ll go to bed at night every day thinking about this guys. And that’s a bad place to be. That’s the message that I would like to deliver in this call. When asked by Bloomberg’s Joe Deaux about why he had taken aim at Korn, Goncalves didn’t hold back. “The Goldman Sachs commodities desk has been wrong about iron ore prices, years in a row,” he said.